Princess Beatrice looked super classy in black at the event. Source: Getty. She’s known for her dramatic style on public outings but Princess Beatrice kept her look very classy and elegant for her latest event, as she turned back time with some ’80s-inspired shoulder pads. The 30-year-old royal flashed a huge smile as she joined friends at the launch of the second collaboration between Misela & Alice Naylor-Leyland in London. Wearing an above-the-knee black velvet-look dress with simple blue detailing, Fergie’s daughter showed off an effortless look with long sleeves and a high neck finishing off the frock – completed with the larger, statement shoulder pads. Wearing black tights and simple black heels, Beatrice went for a more understated look and wore her hair loose over her shoulders as she posed for photos alongside her friends. 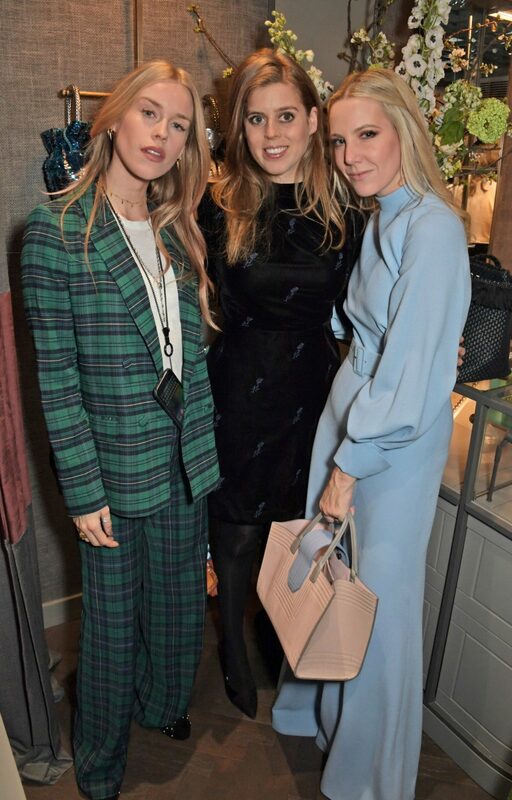 Mary Charteris, Princess Beatrice of York and Alice Naylor Leyland all posed together. Source: Getty. She was joined at the event by English socialite Alice Naylor Leyland herself, who looked stunning for her big night in a flared blue jumpsuit which showed off her amazing figure. It comes after Eugenie’s older sister made her first public appearance with her new property developer boyfriend Edoardo Mapelli Mozzi alongside the Duchess of Cambridge at a black tie gala in London. Beatrice looked beautiful in black at the fashion event. Source: Getty. This time, Beatrice looked a million dollars in a red velvet dress, black tights and navy blue velvet-style heels. She cinched the loose outfit in at the waist with a statement belt and wore her hair down in soft curls. The event was held to raise funds for a special project, working to help refurbish the National Portrait Gallery’s building – called Inspiring People: Transforming our National Portrait Gallery. Princess Beatrice made her first public appearance with boyfriend Edoardo Mapelli Mozzi. Source: Getty. And she’s been busy in recent weeks as last month the young royal made a glamorous appearance at the GSMA Mobile World Congress, where she delivered a passionate speech at the Women2Tech keynote and diversity panel titled Scaling your Business for Success. Do you like Beatrice’s latest outfit?